Snark aside, I want to solve the problem in this article. First, let’s go way back to basics and talk about variables. It’s absolutely a leap to go from the concrete world of numbers to something more representational. Instead of jumping straight into abstraction, let’s use analogies! First, note that variable implies something that varies. While we used to use just numbers and equations like 8+2=10, now we have expressions like 8x+2 or x*x. The value of this expression varies depending on what value we assign to x. This is the tricky part, because we’re used to things that stand by themselves and don’t vary depending on some other context. OR DO WE? I had a yen for cookies. By itself, the sentence is ambiguous. Are you saying you are buying extremely cheap cookies in Japan or Hawaii? Or do you feel like eating some scrumptious small baked goods? Or am I hanging out in your kitchen helping you bake? In this expression, “yen” could mean three different things. And depending on what value you put in for “yen” you’ll have completely different meanings. He offered me cake, but I had a yen for cookies. I couldn’t afford a real meal, but I had a yen for cookies. I have lots of helpful culinary friends named Yen. 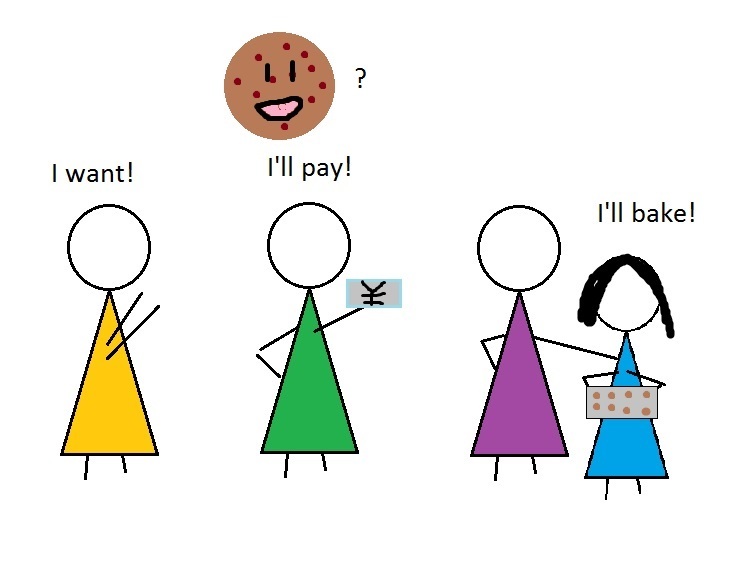 I had a yen to make bread; I had a yen roasting meat; and I had a yen for cookies. By adding context we narrowed down the sentence meaning to be unambiguous. This is like adding an = sign to an expression. So with 8x+2, the value of the expression could’ve been 10 (if x=1), or 0 (if x=-4), or 3000 (if x=374.75), or anything really. But if we add an = sign and have 8x+2=18, then we’ve declared that 8x+2 is unambiguously 18. So x is unambiguously . Sometimes we still might have multiple solutions to an equation. My sentence could be “I was in Japan, and I had a yen for cookies.” In fact, sentences like that basically make up all the captions in this blog. So I could have an equation like x*x=1, and we’d have two solutions: x=1 works, and so does x=-1. That’s that for the concept! Let’s apply some algebra to that tweet. We have a total of $15,000,000 brought in. Some of this is from $6 digital rentals, and some is from $15 sales. And we have 2000000 transactions in total. So let’s figure out how many transactions came from rentals, and how many from sales. Then we can figure out how much money sales brought in, and how much money rentals brought in. That was a heavy paragraph, so let’s break it down. What do we want in the end? How much money came from rentals, and how much came from sales. How can we calculate how much money came from rentals? Well, we can figure out how many rentals there were, and then multiply by 6, since each rental is $6. Similarly, we can figure out the number of sales, and multiply by 15. So let’s figure out the number of rentals and sales, using algebra. Which means that S=3/9=1/3. Going back to that solved equation earlier, this means that R=2-S=2-1/3=5/3. So there were 1/3 million sales and 5/3 million rentals. Going back to our “what are we looking for” paragraph, this means that $10,000,000 came from rentals, and $5,000,000 came from sales. Of course, you could’ve just put this into wolfram instead of breaking it down into all the pieces like we did. This post was mostly aimed at my old math 34a students at UCSB. Likely the people who usually read the math posts on this blog won’t be interested in this post, but maybe you can pass it on to someone else! One engineer I know got tripped up by the simple calculus question: if the derivative of y-squared is 2y then why is the derivative of 5-squared equal to zero? Somehow i missed this comment; I’m sorry! Thanks for stopping by. Yes, variables and constants get mixed up all the time. But also, this is hilarious! Nice concise explanation. However especially with calculus students many of them do not go on to discover discrete math so their strengths probably rest elsewhere.